What’s That Odor Lingering in My Fireplace? Chimney Smells? What’s That Odor Lingering in My Fireplace? All fireplaces have some type of odor, but a normal working fireplace will send the smell up and out of the chimney with the draft before it seeps into the home. 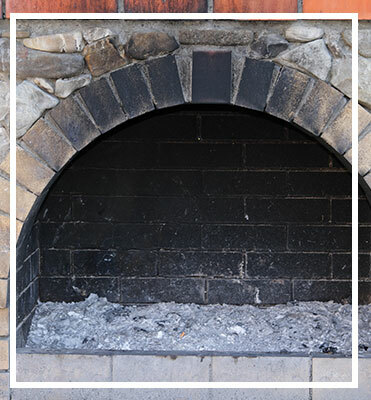 If you have a smell coming in from your fireplace, it could mean that air from the outside is being sucked into the room. There are two fixes for this problem… One is to not allow the smelly air to come into the home, and the other is to get rid of the smell in the first place. Unless you want to completely cover up your beautiful fireplace area, we recommend the second option (getting rid of the smell, and making sure it doesn’t happen again)! A fireplace inspection and sweep is a good first step to any smell issue, as it will remove excess creosote and rule out other common problems that may have caused the smell. Fallen leaves and rotting animals will be found and removed with a thorough chimney cleaning, thus eliminating these options as a cause for the smell. While a thorough cleaning and inspection are helpful, they do not always take care of the problem. For issues with creosote, it is difficult to completely remove the build up as it seeps into the stone masonry. Also, moisture problems and air pressure issues may still remain. Therefore other actions may be taken to rid the home of the smell altogether. If your fireplace and chimney have not been cleaned in some time, the built-up creosote and soot when combined with humid, summer heat and moisture from rain will produce an unpleasant odor as well. A yearly chimney sweeping will prevent this buildup from occurring. The two most common causes of fireplace odor are water seeping into the chimney, and negative air pressure in the home causing the smells to enter the room rather than leave the chimney through the roof. To ensure that water is not the problem, check and make sure you have a rain cap covering the top of the chimney flue (chimney cap). Ideally, you want the exterior of the chimney to be as waterproof as possible and not allow moisture or humidity into the chimney shaft. Secondly, the negative air pressure can cause odors to enter the home, no matter what the cause. To resolve this issue, you must compensate for what is causing the negative pressure in your home. This problem is more prominent during the warmer months after weatherizing has been done to the home or venting changes and improvements have been made. These all change the air pressure in the home and may cause the negative air pressure. The change in pressure inside the home could come from new furnace installation; windows, dryers, new roofing, bathroom and kitchen exhaust fans, or other similar home improvements. Let 1st Choice Chimney Handle the Issue!